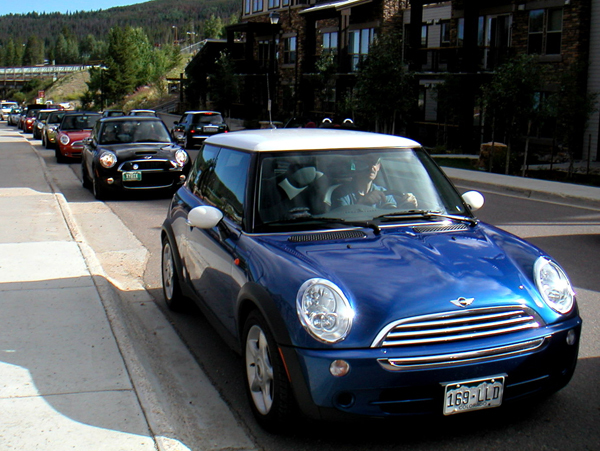 A MINI Invasion to Colorado in August 2010! 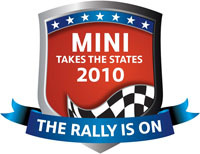 The third annual Mini Takes The States, motoring from various points in the USA, had their grand finale in Denver. 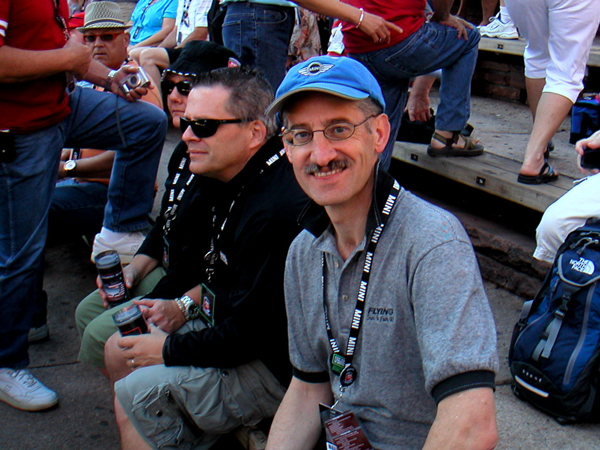 All kinds of fun concerts, picnics, parties, booths with stuff for your car, opportunities to meet other drivers – we talked to people from all over the USA and Canada. The Driver is ready: Let's Motor! Hanging out the window to get the view behind our car. Some sort of MINI traffic jam! 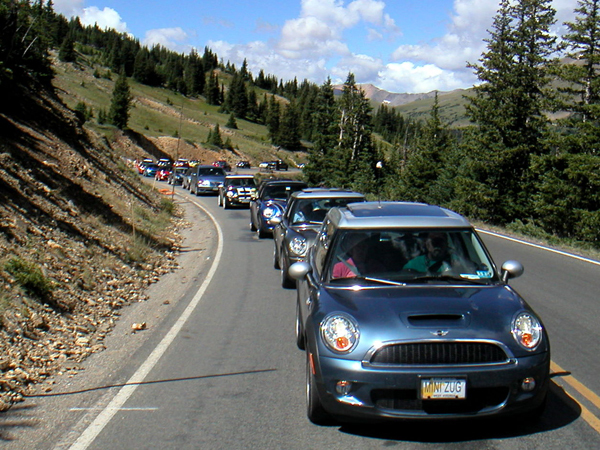 This is a chain of us rallying up Trail Ridge road in Rocky Mt National Park. We turned around at the top, enjoyed the scenery, a picnic and spent some time in the park before heading back to Winter Park. Thursday evening was a MINI Parade to downtown Winter Park – then a picnic and concert in the park. 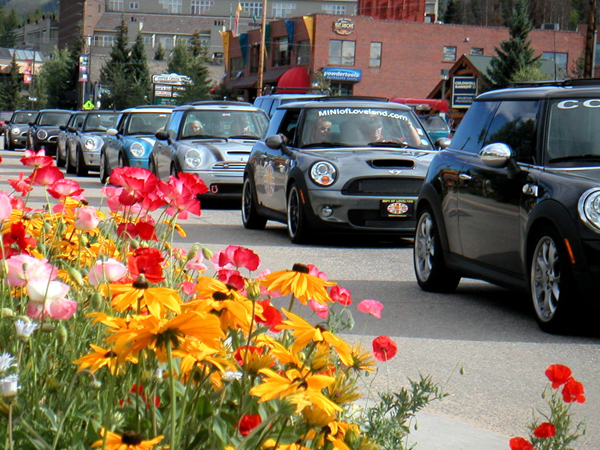 Over 200 Minis parked on Main Street – very fun to see! After a great BBQ lunch on top of the mountain, all the cars met at the ski area parking lot for this group photo. That is us lower left hand corner – Pam sitting in front with her arms up in a V.
Friday night we went to a fabulous party in Denver with great food and drinks provided by MINI. We did not party so hardy that we couldn’t make the early Saturday morning meet-up and breakfast at Red Rocks – another group photo followed by a rally to Nederland for lunch. We are the MINI to the top left corner of the 0000 van: this was The Destination for all the cars from across the country. 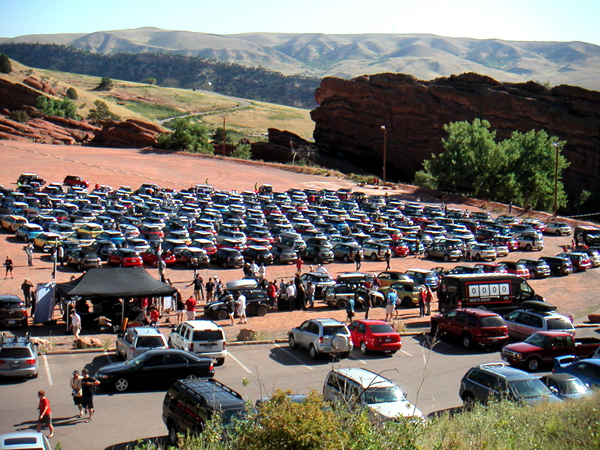 0000 Miles to go:All the Minis have converged on Red Rocks! 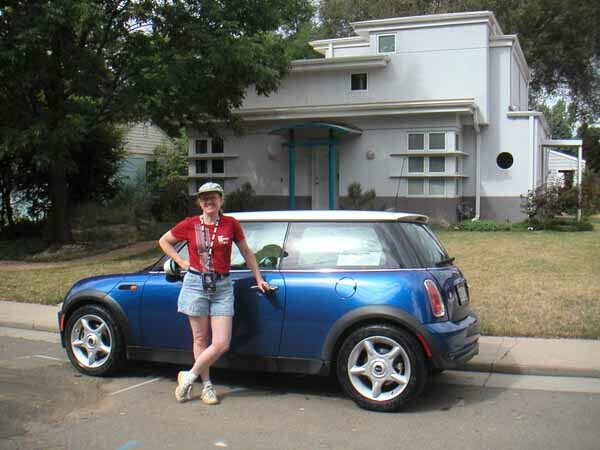 Back in Denver, there was a circuit set up to race a MINI – both of us got a turn on the course in an Electric MINI – very fun to drive. Pam also got to go on a lap with a professional driver – it felt like he took some of the turns on two wheels. Now we know how much we can push the MINI…no more wimpy driving! We finished up the day with a dinner, concert, massage, and other event booths. Saying good-bye to our new friends: Until next year. This entry was posted in Automobiles, Colorado, National Parks. Bookmark the permalink.